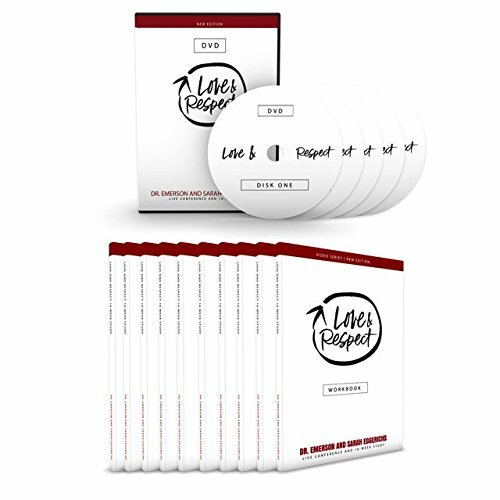 In this set you will receive a copy of the conference DVDs and 10 comprehensive workbooks (which include a LEADER'S GUIDE) for facilitating your small group. The "live" Love & Respect Marriage Conference has been presented to audiences all over the country for the last 17 years and is now available in HD on DVD for the first time! It is perfect for individuals, couples and small groups and includes (10) accompanying comprehensive workbooks. The workbook includes a fill-in-the-blank in-session guide (this will mimic what an actual conference participant is doing), comprehensive discussion questions, space for reflection, mid-week devotions, and more. The DVDs are divided into 10 sessions with introductions to each conference session from Dr. Emerson Eggerichs. Why do we negatively react to each other in marriage? This will be explained in what is called the Crazy Cycle. DVDs are close-captioned for the hearing impaired. If you have any questions about this product by Love and Respect Ministries, contact us by completing and submitting the form below. If you are looking for a specif part number, please include it with your message.